DDM, Dual Diaphragm Matrix, actually use two individual drivers, Tweeter in front and Woofer in back. The coaxial structure, having two drivers placed on the same axis, is a Radius own appropriately technology. 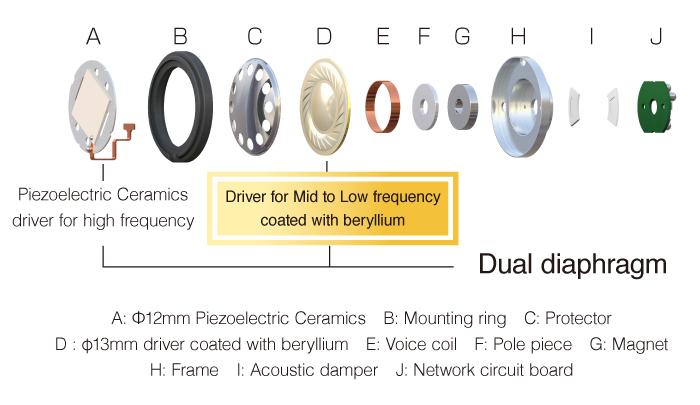 Because of applying beryllium coating to the woofer’s diaphragm the frequency response is extended. Together with ceramic tweeter the transient response has been improved. Piezo elements constructed on the multiple ceramic layers corresponds to the nature of Hi-Res music, even to the delicate quiet range. Energy of low and mid range that is launched from the rear driver and come out through the holes on the piezo driver, fuse with high range energy on the same axis. Newly designed Deep Mount earpiece. Its' unique shape provide tight fit to the ear canals providing a rich bass reproduction. Mounting position of the earpieces can be adjusted in two stages to achieve a more accurate musical reproduction without missing bass by optimizing their position. Furthermore, while increasing the sound insulation by the secure fit to their ears, they reduce stress on the ears. It is also recommended to use under the noisy environment such as commuting. Detachable cable by introducing MMCX (micro-miniature coaxial) connector. Cable can easily replaced with new one in case of the failure event. Includes elegant and exclusive carrying case.